And behold, Jesus mud-wrestled the creature amidst the uterine juices of damnation. And lo, it was icky. MARY SHELLEY’S FRANKENSTEIN has the reputation for following its infamous source material closely – Mary Shelley’s groundbreaking 1818 novel, Frankenstein; or, The Modern Prometheus. The fact that it follows the book only barely, and the fact that people yet put on airs when lauding the movie as authentic shows how much people actually read. 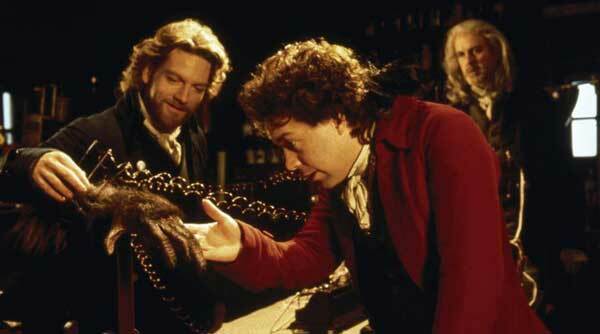 Frankenstein keeps the “monster” a secret from his betrothed Elizabeth (Helena Bonham Carter), and best friend Clerval (Tom Hulce). (I feel so sorry for Hulce in this role. At the time, he was cultivating a reputation of accepting only noteworthy acting gigs, which were rare. After his magnificent turn as a titan himself in 1984’s AMADEUS, this period piece, with its caliber of talent and majestic intent, seemed like a natural progression for him. Alas, his talents are muted by the material and the lackluster filmmaking.) Ian Holm is dad, on his gigantic English estate; Richard Briers is the old blind man with whom the monster finds a moment’s respite, and John Cleese makes an excellent serious cameo as an outlaw professor. Historical Fact: early dildos just looked like monkey paws. An element of the film that fakes us into believing it is loyal to the novel is the opening sequence featuring Aidan Quinn as Captain Walton, helming a foundering ship through arctic ice and coming upon Frankenstein pursuing his creature. The whole tale is then told in flashback by Frankenstein. This device is also used to frame the novel, but the novel goes deeper, telling it from the point of view of Walton relating Frankenstein’s tale, who, in turn, devotes a large chunk of dialogue to relating his creature’s tale, so the book seems like three flashbacks in one. Of all the deviations from the book, there are two that benefit the film; first, John Cleese’s brain in the creature (Cleese is Professor Waldman, killed by a fanatic, whose head is cut into by Frankenstein for his intellect); second, instead of reanimating a nameless grab of body parts at the creature’s insistence of a female mate, Frankenstein reanimates his own lover – the murdered Elizabeth! The Cleese-brain plot point is wasted, as the creature is struck on the head by a falling beam when birthed, effectively negating all those potentially interesting avenues involving a professor’s brain driving the leviathan. However, the reanimated-Elizabeth plotline is undoubtedly ominous and actually “scary.” In a weeping fervor, Frankenstein lops off the head of his original female (in this story, she is a relative of Frankenstein’s that the creature murdered; in the novel, a clutch of body-parts) and stitches on dead Elizabeth’s head (obviously following the handbook on Medical Procedures Made Simple.) When she comes to, Bonham Carter gives a disturbing performance as someone slowly discovering they are reanimated. As Superman was the first true cinematic superhero, Frankenstein created the first cinematic Monster. In this telling, we sidle up pretty close to Shelley’s original vision of the creature itself – an intelligent being shunned and lonely, seeking revenge for the forced life thrust upon it – but even one of the world’s greatest actors cannot make us feel any compassion toward this poorly fleshed-out, tragic beast. I truly think the problem lies in Shelley’s original work, for her Victor Frankenstein is a confused character whose emotions turn on a dime when it comes to desire to create a living being and then revulsion once that being is created. 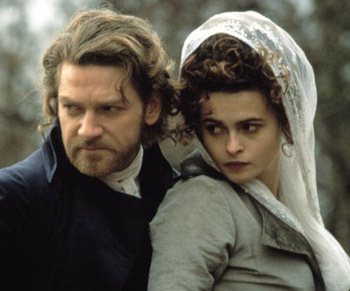 And so Branagh tries to portray that fickleness in the movie, but this is not a natural human reaction, so it misses the dramatic mark: When his new man-creature is birthed (in a scene that dwells too long on both Branagh and a naked De Niro entwined like female wrestlers in sensual amniotic slime), the creature is inadvertently chained and knocked unconscious. What does Franky do? Leave the creature hanging there and starts contemplating his navel. Are you a scientist, man?! Start doing tests, examining the creature’s metabolism, heart rate, skin regeneration, reflexes, etc.! What’s with all this philosophical mooning? Shelley creates a great allusion in the subtitle of her book, The Modern Prometheus, but chooses to go the route of simple-minded murder than the more interesting plot of society being exposed to this scientific wonder. As Prometheus stole forbidden knowledge of the gods and bequeathed it to Man, Victor Frankenstein treads that crucible, so we can excuse a modicum of self-examination and fear, but cannot we also revel in the unbounded excellence of the experiment’s success? We must recall Mary Shelley was 18 when she penned this tale. Though her writing style is grandiose and exhibits a vocabulary which puts modern 18-year-olds to shame, her knowledge of scientific practices and story devices like characterization and motivation was virtually nil. She did a great job capturing the essence of a disturbing idea that probes at a primal fear of mankind – which is why the tale is so universally embraced – however she blithely set forth her characters’ actions, sprinkled liberally with flowery language, and hoped to disguise the fact there was hardly any substance behind their deeds. The creature is also quite shallow, birthed with the intellect of an infant, soon turning to murder for no reason other than to jealously bait his creator. (And why do we perfunctorily call the creature a “monster” anyway? The “monster” epithet could probably be applied after he starts killing people, but we are conditioned to think of him as that from the outset!) And De Niro doesn’t help, seemingly just reading his lines and waiting for the knockoff bell to take off this goddam makeup. His leaden performance leads us to believe someone made him an offer he couldn’t refuse. Shelley’s novel never mentions the process by which the living person is created, because – she was not a scientist, but every Frankenstein movie has utilized electricity/lightning to reanimate the creature. A creative new device here is – electric eels! In the final telling, MARY SHELLEY’S FRANKENSTEIN has merits and demerits that cancel each other out. At least it’s sincere in trying to be authentic. But in its adherence to Shelley’s dated, drab approach, it becomes as inauthentic as all the other Frankensteins ever loosed into cinema. What do I mean by this? Well, as an example, the creature never raises his voice; he speaks calmly and articulately, because that was the ethos of the day – intelligent conversation, not Running and Screaming. The “terror” has not been updated to today’s “entertainment” standards. The filmmakers also fail to convey the true intended horror of Frankenstein’s tale – the forbidden “tampering in God’s domain.” Although there is no religiosity in Shelley’s work, that unholy element was the unspoken heretical dread of creating life from nothing back in the 1800s. It was a trespass unforgivable. No one is getting that message now. Partly because we have become inured to the Frankenstein story over decades, partly because spiritual outrage is a thing of the past, and partly because the acting is so mediocre. Next: THE GODFATHER PART IV, starring Abby Normal. Writers: Mary Shelley, Steph Lady, Frank Darabont. Starring: Robert De Niro, Kenneth Branagh, Tom Hulce, Helena Bonham Carter, Aidan Quinn, Ian Holm, Richard Briers, John Cleese, Robert Hardy.